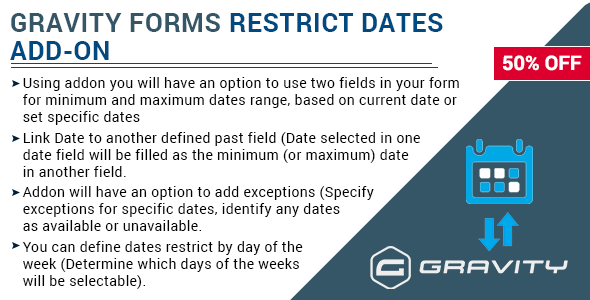 Gravity Forms Restrict dates is a Gravity forms addon that allows users to restrict the selectable dates in your form date picker field. This add-on will help you to create your gravity form and add a date field, then manage the dates range which will be displayed to the user. With this addon you can define allowed future or past dates. You can define dates r estrict by day of the week (Determine which days of the weeks will be selectable). Addon will have an option to add exceptions (Specify exceptions for specific dates, identify any dates as available or unavailable. Link Date to another defined past field (Date selected in one date field will be filled as the minimum (or maximum) date in another field. Navigate to section Date settings in advanced settings. i. Add the Minimum Date, Maximum Date, Days of the Week, and Exceptions settings. The minimum and maximum dates setting allow you to specify the beginning and ending dates that can be selected in the date field. Specify a specific date which will be the earliest (Min) or latest dates (Max) selectable in the current Date field. The current date will be the earliest (Min) date and latest(Max) selectable in the current Date field. This is a dynamic value and will automatically adjust to the current date with each new day. allows you to modify the selected date by adding or subtracting days, weeks, months or years. It’s available when the Current Date option is selected. The Days of the Week setting allows you to r estrict which dates are selectable based on the days of the week (e.g. Monday – Sunday). By default, all days are allowed. Uncheck all days option to select specific days. Exceptions allow you to define the date limitations . An exception works with both selectable dates and unselectable dates. If the excepted date is selectable, it will now be unselectable. If the excepted date is unselectable, it will now be selectable.